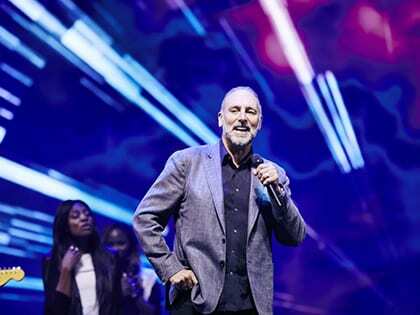 Home Features Brian Houston: If You Want to Be Great, Serve—and Dream. Brian Houston: If You Want to Be Great, Serve—and Dream. Most people have the will to live; fewer people have the will to succeed, because of the personal cost involved; still fewer people have the will to serve. The point of serving God is that we live to succeed and we succeed to serve. When you live with a dream in your heart and with humility to serve, you really live. When your dreams and your success are centered on serving the cause of Christ and those around you, you become part of the one percent. Who is the one percent? The group of once-in-a-generation type of leaders who cause others to sit up and take notice. The people who, regardless of their inhibitions and limitations, are determined to live out their dreams and fulfill their destinies. People who believe deep down that they are called to do something important with their lives. So what happens when ordinary people begin to serve—to live their lives with a purpose in mind and focus on making it happen? The dust of the ground is the domain of servants, while the stars of the sky are the realms of kings. When we have servant hearts, it makes us perfect fits for greatness and impossibilities realized, for blessings promised and for the Word of God to work in our lives. Jesus said, “Whoever desires to become great among you, let him be your servant. And whoever desires to be first among you, let him be your slave—just as the Son of Man did not come to be served, but to serve, and to give his life a ransom for many” (Matt. 20:26–28). We should never underestimate what God can do with the dreams in our hearts and the dust of the ground. I don’t know what we’d do with a rib—maybe cook it up or give it to the dog—but God took a rib and made something of exquisite beauty: woman (Gen. 2:22). He began with the dust, but he didn’t leave things there. We serve an amazing God! If you have a dream in your heart, then you need to be a sower. A sower works the ground, and the process of sowing and reaping is a principle of the ground. Reaping what you sow is not just an Old Testament idea or a New Testament idea; it’s an eternal principle, a biblical promise. If you sow in good ground, you will reap a harvest. In other words, what will get you to your dream—what you sow—is what will keep your dream thriving. Essentially, servants live for something far greater than themselves. Servants understand the value of their contribution in building something great. Many years ago, when my television ministry was a very simple setup in a makeshift studio out behind one of our office buildings, a young boy used to volunteer each week to make coffee, run errands and serve the producer and small crew of people who made it happen. When he was just fourteen years of age, his mum would drop him off each week, and with a pure heart and a spirit to learn, he simply hung around the studios taking in the wonder of film and television and doing whatever was needed, no matter how big or small. Ten years into the future, and the dream in this boy’s heart began to take shape as his talents made a way for him onto the set, and eventually he became the director of one of Australia’s longest-running and most-watched television series (Home & Away). It was on the set of this show that he met his wife, one of the lead actresses in the program and also a believer in Christ. However, it was never his aspiration to climb the ladder of corporate success in Hollywood. He always kept a secret longing in his heart to attach his obvious talents to the kingdom of God, and wherever possible he continued to serve the vision of Hillsong through consultation and volunteering. Today Ben Field is the head of our entire Hillsong film and television department and the creative genius behind all the content on Hillsong Channel. Week in and week out, he manages a growing staff of producers, directors, production teams, writers and editors who are creating cutting-edge media for our church and global audiences. His passion for the church, willingness to serve and expertise in his field have set him up to be a great blessing to Bobbie and me and to take us forward in the world of television and other media in a way we never imagined. Impossibilities are made possible through our daily choices. The Word of God says it plainly: if you want to be great, serve. It’s how Jesus ministered on earth, with service being the quality that set him apart from all others. Never underestimate the power of servant leadership. Remember, in the kingdom of God, the way up is down. The road to reaching the lofty heights of our dreams and visions for the future begins on the dusty ground of servanthood. And the act of becoming a servant will move you from the ordinary to the extraordinary. Your dreams are nothing compared to God’s dreams for you. There is more to your life than what you can even imagine, so why not dare to dream big? The Bible goes on to tell us that not only did Joseph’s dreams come to fruition, but his unexpected position and power in Egypt brought safety and care to his family and the nation. Your destiny is abundantly above all you could ask or imagine; your success, much like Joseph’s, was planned and dreamed for even before the foundations of the earth. Just as Joseph’s destiny ultimately took him to a place of great influence and authority, so too can your future bring blessing into your life and positively affect the lives of those around you. For us as believers, our success is never just for ourselves, and so often it simply starts with a dream. Adapted from There Is More by Brian Houston, copyright © 2018. Used by permission of WaterBrook, an imprint of Penguin Random House. All rights reserved.